Professional simulation models are built using the knowledge and insight of experts. 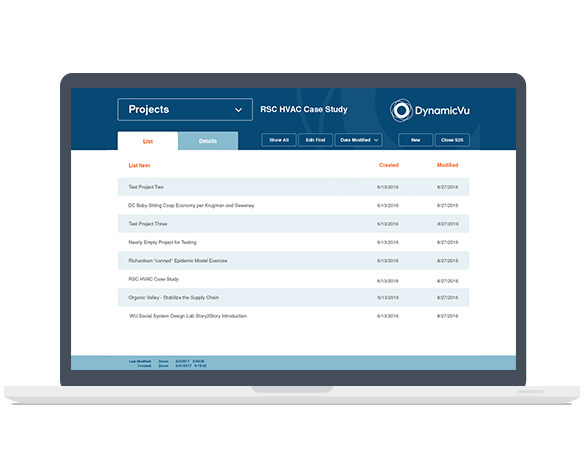 DynamicVu organizes publications, personal quotes, tables of data, even diagrams, recordings and videos making them available when and where you need them most. What is your data management strategy? DynamicVu is data management software for professional simulation modelers. Be organized and efficient. Easily recall specific data while modeling. Link model structure to expert testimony. Make your models more transparent with DynamicVu. If your simulation models are built with carefully collected data, then DynamicVu can help you be more efficient. Whether you are researching publications or performing interviews, DynamicVu will keep track of these critical records. DynamicVu provides a way to link data to its source giving you confidence while modeling, and transparency while presenting. DynamicVu organizes the people involved with each Project. Participants can be experts in the system being investigated, sponsors of the project, or facilitators and modelers. DynamicVu organizes the date/time that work was performed. Sessions create an historical inference chain of what was said by whom and when. DynamicVu organizes all of the information that is generated from experts through interviews, research, or other useful processes. DynamicVu links key information back to the source and session where it was discovered.